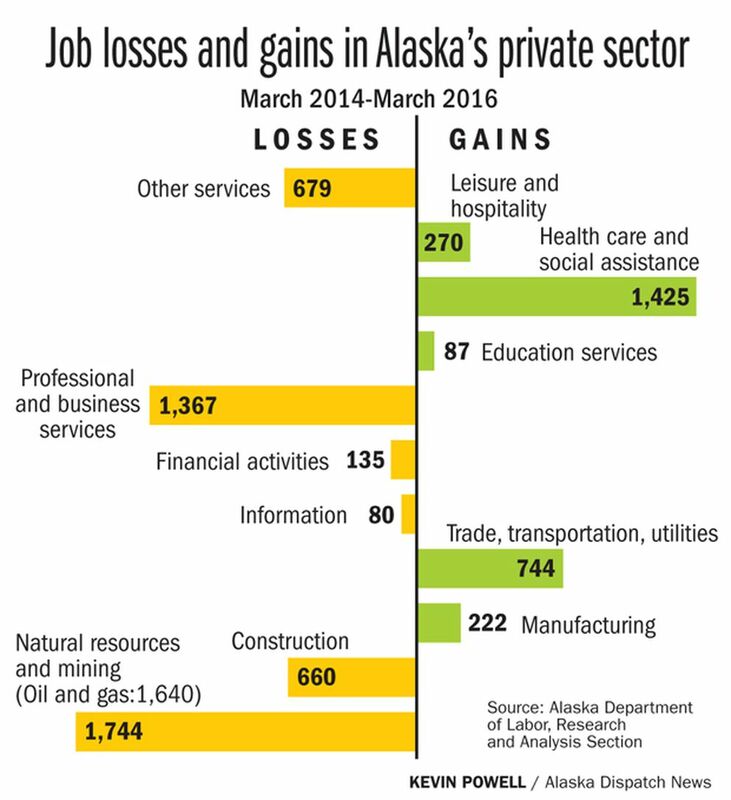 About 60 percent of the boroughs and census areas in Alaska have lost jobs as oil prices have plummeted over the past two years. That's one of the takeaways from a new report from the University of Alaska Anchorage's Institute of Social and Economic Research examining the state's job picture. The study uses job numbers to look at how Alaska's economy changed between March 2014 and March 2016. During that time, oil prices dropped dramatically, from more than $100 per barrel to below $40. The state lost nearly 1 percent of its jobs in that time frame, a decline of 2,261, the report found. In the private sector, the oil and gas industry was hit the hardest, losing more than 1,600 jobs. State government lost about 1,700. Some sectors grew during those two years. Local government, for example, added 800 jobs. The report focused on wage and salary jobs in Alaska, meaning it doesn't include thousands of military personnel — or fishermen, who are categorized as self-employed. Following oil and gas, professional and business services as well as construction were among the top job-losers. "With less money in the economy, there is less demand for many services," the report said. "The weakening business environment generally leads businesses to trim their temporary staffs, cut advertising expenses, and curtail investments in information technology." In contrast, the report said, "strong growth continued in the health-care sector," which added 1,400 jobs, as well as transportation and utilities and leisure and hospitality. State government and private-sector jobs are tied to oil prices in different ways. State government "affects the economy by spending the revenues it collects from oil," the report notes, while jobs in the private sector include employment in oil and gas, jobs created when oil and gas firms make purchases from other companies, and jobs tied to oil and gas workers spend money in the economy. Mouhcine Guettabi, an ISER assistant professor of economics and author of the study, said one surprise was the impact on jobs with local governments. "It's not just the state jobs or natural resources jobs that are in jeopardy, but also local government jobs, because local government revenue is also dependent on state revenue," he said. "That vulnerability, I hadn't seen spoken about very much." Oil revenues made up 90 percent of Alaska's general fund revenues between 2005 and 2014, the report noted. But as oil prices tanked, so too did the state's budget, which faces a multibillion-dollar deficit. Anchorage lost the largest number of jobs at nearly 1,500, or about 1 percent, the report said. The place in Alaska with the biggest job growth after the Matanuska-Susitna Borough (with a gain of 1,133 jobs) might come as a bit of a surprise: the Aleutians East Borough, which saw job growth of 36 percent or 856 jobs during these two years. Those were all in the private sector. Guettabi wasn't sure about the reason behind that number. "Once you look at those declines or increase in job numbers, you want to try to explain them," he said, "but some cases like this one, I was at a bit of loss." You can read the full report online at ISER's website. This is the first of several papers the institute will produce "that will examine various economic and fiscal issues important to Alaska." Annie Zak covers business news and general assignments.